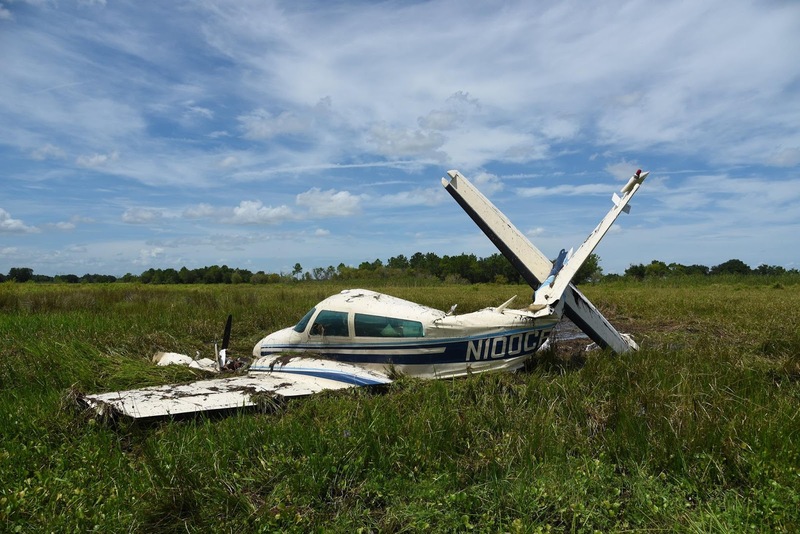 On July 11, 2016, about 1100 eastern daylight time, a Cessna 310Q, N100CP, was substantially damaged during a forced landing near Bartow, Florida. The commercial pilot sustained minor injuries. Visual meteorological conditions prevailed, and no flight plan had been filed for the local aerial photography flight that departed from Bartow Municipal Airport (BOW), Bartow, Florida, at 0845. The flight was conducted under the provisions of Title 14 Code of Federal Regulations Part 91. According to the pilot, the preflight inspection of the airplane revealed no anomalies; the fuel tanks were full, and no water or contaminants were visible in the fuel samples taken. The engine run-up, takeoff, and climb to 13,500 feet mean sea level (msl) were "normal," and the cruise power setting was 27" of manifold pressure at 2,200 rpm for the flight. After 2 hours, the pilot descended for landing at BOW. The airplane entered the traffic pattern, and as the left turn onto the base leg of the traffic pattern was completed, the right engine lost power. 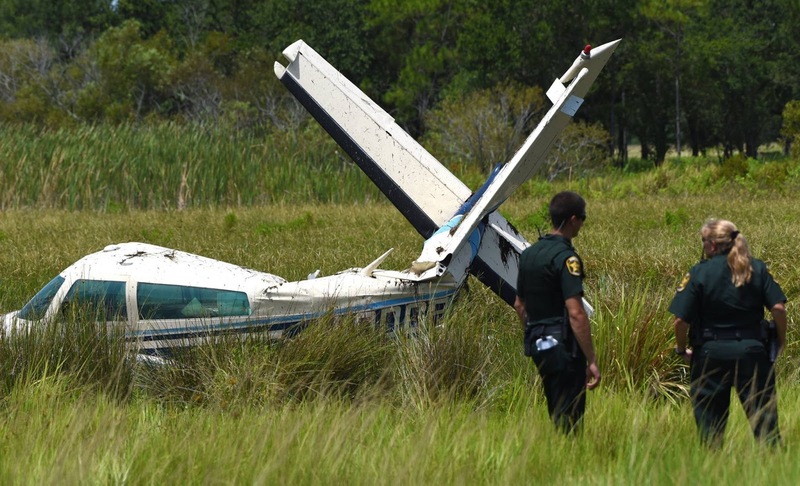 The pilot confirmed there was "available fuel," turned toward the runway threshold, and "recognized" that the left engine was also no longer producing power. The pilot concluded that the airplane would not reach the airport, selected a forced landing area, and completed the forced landing to swampy terrain. 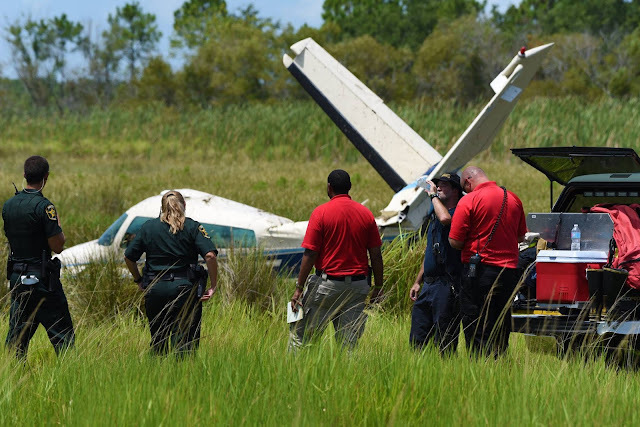 A Federal Aviation Inspector (FAA) inspector noted that the airplane came to rest in knee-deep water about 1 mile northwest of the airport. The airplane came to rest upright and there was substantial damage to the wings, empennage, and tail section. The inspector further noted that neither propeller appeared to be feathered, the right engine propeller blades appeared to be bent aft, and the left engine propeller blades were straight. Both fuel selector valve handles were found in the Auxiliary position. Examination of the auxiliary fuel tanks revealed an odor of fuel, but each tank appeared empty. Due to the swampy terrain conditions, the airplane could not be further examined on site, and was moved to a secure storage facility. During recovery of the airplane, it was noted that the fuel tanks on the right side of the airplane were damaged and voided by impact. The main tip tank was separated from the left wing, and several gallons of fuel were drained from the auxiliary left wing and the left wing-locker tank. A Shadin Fuel Flow Indicator was recovered from the instrument panel and retained for examination. A detailed examination of the airplane revealed control continuity from the flight controls to the flight control surfaces, and from the engine controls to each engine. A detailed examination of each engine revealed there were no anomalies that would have prevented normal operation. 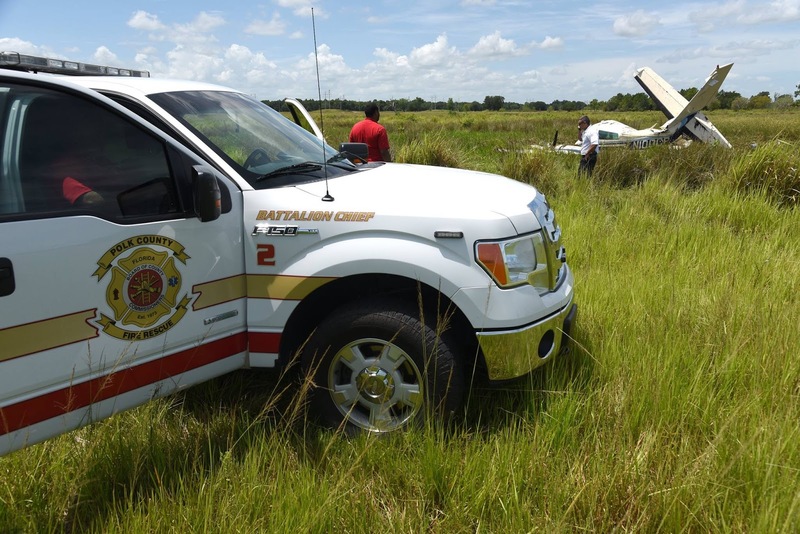 According to FAA records, the pilot held a commercial pilot certificate with ratings for airplane single-engine land, multiengine land and instrument airplane. He was issued an FAA second-class medical certificate on July 1, 2016. The pilot reported 5,107 total hours of flight experience, of which 219 hours were in the accident airplane make and model. The airplane's most recent annual inspection was completed February 1, 2016, at 6637.6 total aircraft hours. At 1315, the weather reported at BOW included few clouds at 2,500 feet and variable winds at 4 knots. The temperature was 31° C, dewpoint was 21° C, and the altimeter setting was 30.13 inches of mercury. Interpolation of performance charts in the manufacturer's owner's manual revealed that the fuel consumption rate for the airplane was an estimated 27 gallons per hour at the power settings reported by the pilot. The Shadin Fuel Flow Indicator was a digital fuel management system designed to provide fuel management information under real-time flight conditions to the flight crew. The unit was connected to engine fuel flow transducers. The unit was capable of transmitting fuel information to certain GPS receivers for additional calculations and display of fuel management data. The unit can display engine fuel flow, fuel used, fuel remaining, and endurance. The unit does not interface with an aircraft's fuel quantity indicating system. The unit required the flight crew to enter the initial fuel on board the airplane. All calculations and data provided by the unit were based on fuel flow. Between power cycles, the unit retained the last fuel used and fuel remaining. When examined in the NTSB Recorders Laboratory, the unit displayed 62.3 gallons used, and 115 gallons remaining, which was consistent with the duration and profile of the accident flight as reported by the pilot. "Since the auxiliary fuel tanks are designed for cruising flight, they are not equipped with pumps and operation near the ground (below 1000 feet AGL) using auxiliary fuel tanks is not recommended." 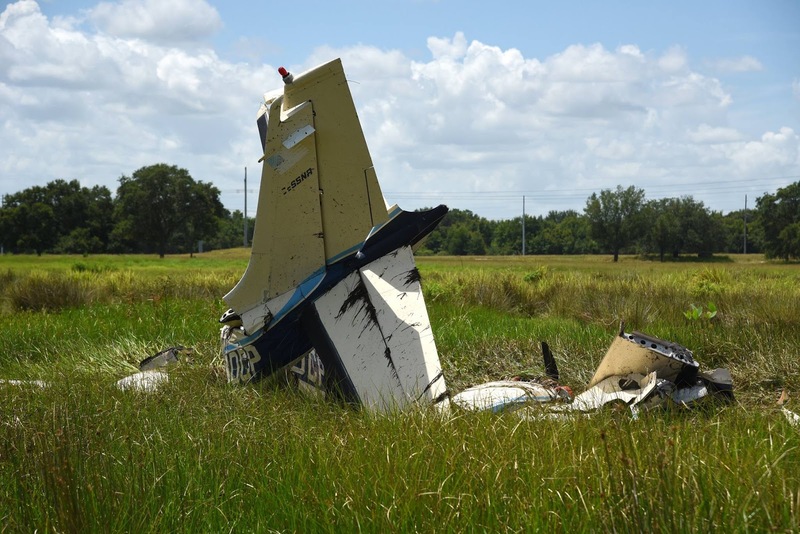 On July 11, 2016, about 1100 eastern daylight time, a Cessna 310Q, N100CP, was substantially damaged during a forced landing near Bartow, Florida. The commercial pilot sustained minor injuries. Visual meteorological conditions prevailed, and no flight plan had been filed for the local photographic imaging flight that departed from Bartow Municipal Airport (BOW), Bartow, Florida. The flight was conducted under the provisions of 14 Code of Federal Regulations Part 91. According to initial Federal Aviation Administration (FAA) reports, the airplane lost right engine power on the downwind leg of the traffic pattern to runway 9L, then lost left engine power, and subsequently impacted swampy terrain near the near the base leg. The responding FAA inspector noted that the airplane came to rest in knee-deep water about 1 mile northwest of the airport. The inspector further noted that neither propeller appeared to be feathered, the right engine propeller blades appeared to be bent aft, and the left engine propeller blades were straight. 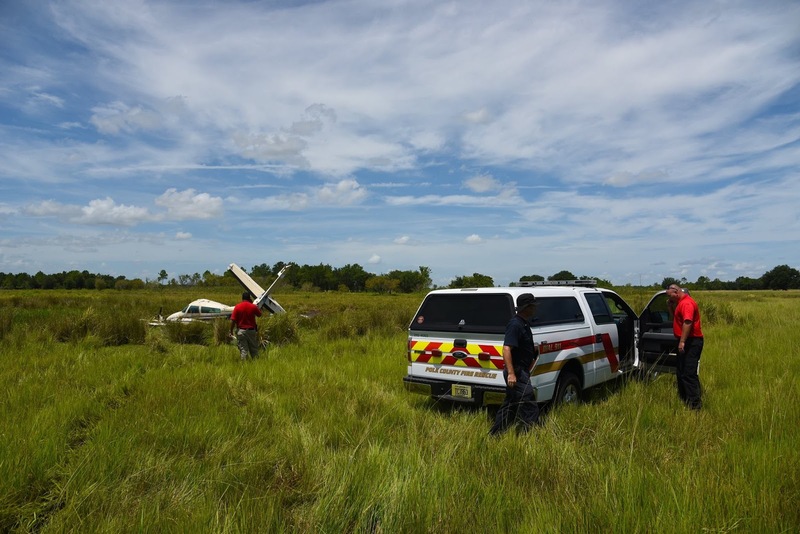 Due to the swampy terrain conditions, the airplane could not be further examined on site. The airplane was recovered to a secure storage facility where it will be examined at a future date. Gawd. Hom many 310 pilots have fallen into this trap... Long time ago I flew the 310 but only a few hours with a type rated fellow sitting left. It was one of the first things he told to me this was a sneaky thing in the 310 design. ^Agree with above commenter sentiments.